Buy now and melt away tension with ‘stress and anxiety’ pure magnesium oil with USA organic essential oils. 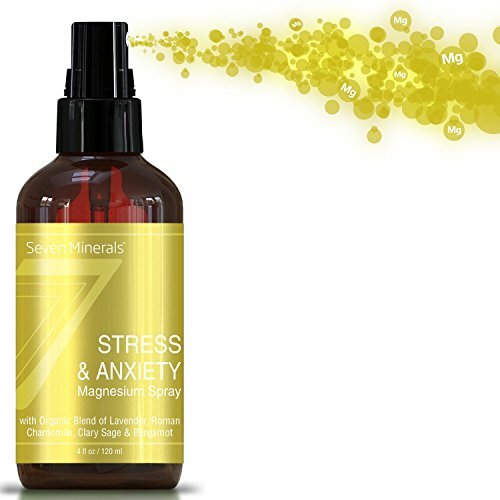 Potent and safe thanks to this unique blend of ionic magnesium + aromatherapy. Experts now use transdermal magnesium therapy as a more effective way to deliver magnesium to body tissues. Ionic magnesium chloride is absorbed through the skin and rapidly into the blood stream, where it arrives safely at your stressed out cells. Now, you may have already tried magnesium pills. But according to science not all magnesium is easily absorbed, so you’re not getting the full benefit. While some products leave you dashing for the bathroom. others leave you wondering if you took anything at all. We’ve also combined the power of USA certified organic aromatherapy. Soothing aromas tickle your senses, while the magnesium goes to work deep in your cells. Not only are you getting a super-saturated solution of magnesium chloride (from 250 million year old sea beds), but you’ll get that extra calm boost from: Lavender oil for a peaceful sleep roman chamomile reduces anxiety clary sage to calm the nervous system bergamot for nervous tension so if you’re still looking for a stress and anxiety remedy or relief from migraines, restless leg syndrome or sleepless nights try ‘stress and anxiety’ transdermal magnesium oil from seven minerals. View More In Body Sprays. If you have any questions about this product by Seven Minerals, contact us by completing and submitting the form below. If you are looking for a specif part number, please include it with your message. Bath and Body Works Vanilla Bean Noel Fine Fragrance Mist 8 Oz. © 2019 - nyatan.com. All Rights Reserved.